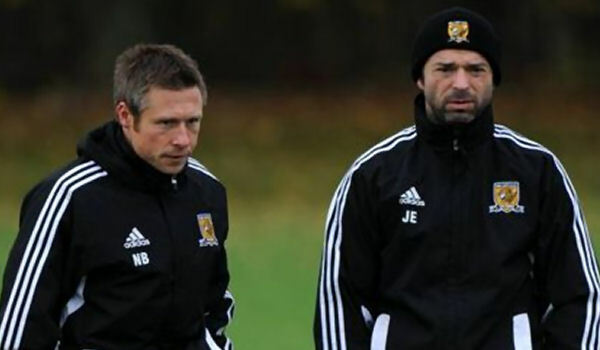 It has been a while since we last trawled through Ebay’s completed listings to celebrate or mourn the varied Hull City shirts that have been snapped up, but the mood has taken us so we’ll review January’s offerings. The biggest news has been the Royal British Legion’s listing of the poppy emblazoned player shirts worn at home to Southampton and away at Burnley. Compared to previous years poppy shirt auctions, these two lots went for peanuts. The player whose shirts went for the most might surprise you, it was Stephen Quinn, who came on as a sub in both of the games which ended in 1-0 defeats. £138 and £131.29 (not including postage) were the final prices of Quinniesta’s shirt pair. That really isn’t a lot of money for matchworn shirts from known games with certificates of authenticity, and many went for much less. 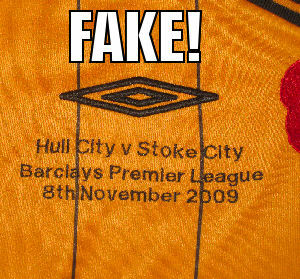 Consider these bargains: Jake Livermore’s shirt from the Burnley game, £69. Sone Aluko’s shirts went for £72 and £70. 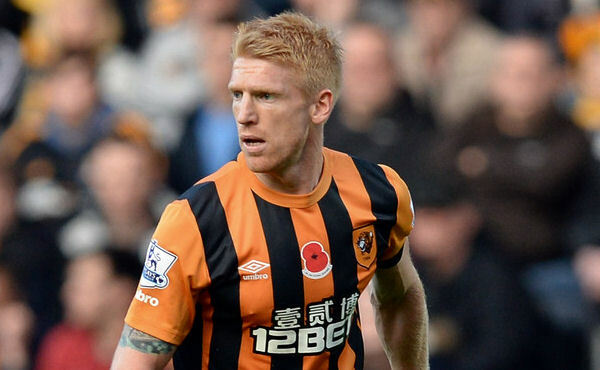 One of Paul McShane’s shirts went for £78.01 while his other went for £103.11, one of only 6 shirts that went for over £100 (the others being Robertson £113.11, Huddlestone £109, Stephen Harper’s aqua keeper shirt used at Turf Moor £101.51 and the Quinn shirts). Why have they gone for so little this year, given that Dele Adebola’s 2011/12 poppy shirt fetched £155, more than any of the current years shirts? The possible reasons are numerous: This year the RBL did the auction themselves rather than having the club do it, and whereas the club would use the OWS and social media accounts to advertise the auctions, this one was essentially unheralded this time round. Also, there were two shirts for each player’s shirts this year, rather than one shirt worn in two games, which doubles the number of shirts available and consequently dilutes bidding war potential. Then there is the time the auction finished: after 1am on a Tuesday morning, when most folk are in bed ahead of a work day, an utterly baffling decision. The combination of these factors has led to less money than you’d expect to be raised for the poppy appeal, but you won’t get many complaints from collectors. Ahead of the auction, the RBL did said they’d limit the amount of shirts one person could buy. Last year every single City poppy shirt was bought by an American sports memorabilia outfit called Nate D. Sanders, who sought to resell them at a hefty profit though they’ve had little joy, no surprise when they list Tom Huddlestone’s shirt for $2000/£1,323, good luck with that! Regardless of RBL’s limit clause, 16 of the 31 available shirts went to one of three buyers, one Ebayer alone bought 7 of them. 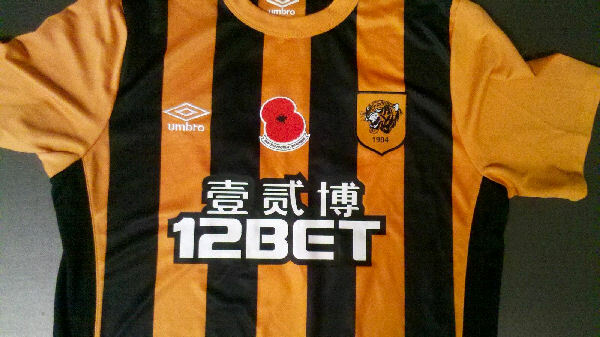 Ordinarily we don’t normally go for poppy shirts, but these were going for so little, we treated ourselves to the one worn by Abel Hernandez against Southampton. Few things are more frustrating for kit collectors than seeing an item appear on completed listings that never showed up on obsessive daily searches or on email alerts set to notify you of such items. 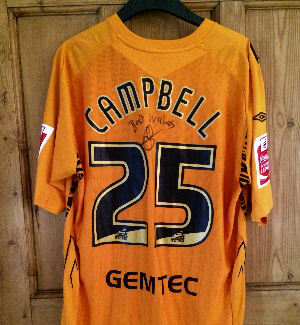 Such an item sold in January: a Fraizer Campbell worn 2007/08 home shirt (with Tiger Leisure COA), used in the home game against Barnsley in which the now unfairly loathed loanee scored twice. The shirt was listed as Buy-It-Now, which is a possible explanation as to how it was missed in our frenzied daily searching, and was sold for £120. That amount is what we consider a reasonable base price for modern matchworn shirts, but given Campbell’s importance in that promotion winning side, it might have fetched a bit more had it been a bidding auction, we’d certainly would have had a crack at it. Overall, matchworn City shirts are going for a lot less now than they did a year ago, there was a time when scores of people would battle each other for shirts used in the basement division, bidding hundreds of pounds. That time seems to have gone, possibly a result of the war of attrition the owners are waging on the traditional club name, and in turn fans who value it, causing a general malaise, because old shirts are not going for much right now. Take this Michael Bridges 2006/07 home shirt that went for just £29.29, a ridiculous price for a very nice shirt. 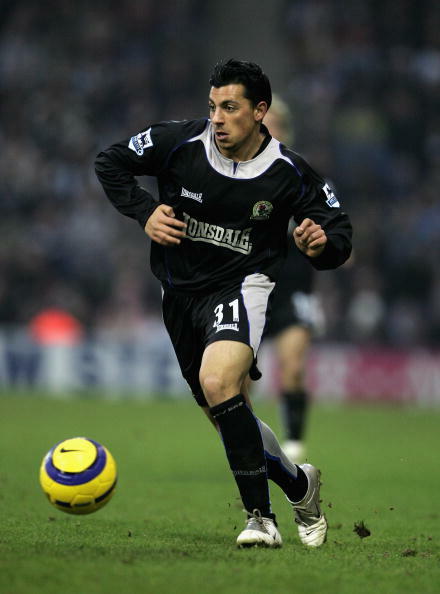 We ruled ourselves out early as we already have a 2006/07 home matchworn and we’re concentrating on getting shirts from seasons that we don’t have, but there was a twinge of regret when we saw that final price. At the time we were focussing on a 2009/10 Geovanni home shirt that after much photo-matching research, we found to be authentic and got for just £50! The placing of names and numbers applied on shirts with pinstripes makes it relatively easy to see if the shirt has been worn when comparing it to match photos, and we found that Geo wore it at home to Manchester United. The seller had sourced the shirt from a Wigan player who had swapped his shirt for Geo’s unused spare shirt in the 3rd round FA Cup tie at the JJB Stadium. Another 2009/10 home shirt went for a similar amount, a supposed Jimmy Bullard matchworn that we didn’t bother researching to see if it was authentic or not, as we wouldn’t wipe our arses using a shirt of his. A better buy was this Joe Dudgeon ‘Tash Converters’ shirt used at Bristol City in 2012/13, it went for £117. Someone was suckered into believing they’d got a 2009/10 poppy shirt in January, and paid £58.57 for a bog standard replica badged up by a coin eyed miscreant. The real poppy shirts didn’t have embroidered game text, it was heat applied, and the three lines of text was confined within two pinstripes, it certainly wasn’t wider than the Umbro logo above it. £58.57 for a fake when a real matchworn poppy shirt from this year went for £69, and a different matchworn went for £29.29, that’s crazy. 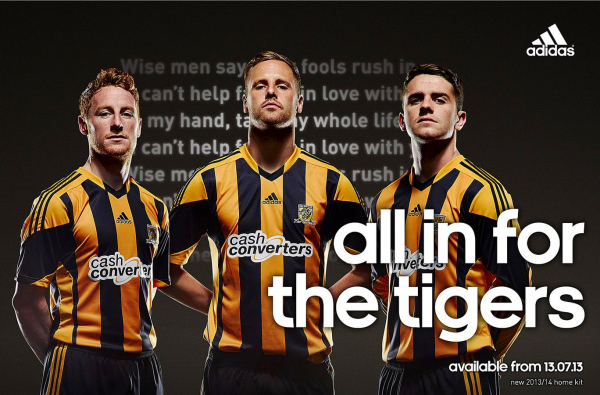 Do your research buyers, granted there are very few cases of Hull City shirt fakery, but this shirt shows it does happen. Caveat emptor. Like the Fraizer Campbell shirt we missed a Buy-It-Now 1999/00 Gareth Williams shirt, that has all the attributes of a real matchworn: the full size letters and numbers, the retroreflective sleeve patches and it’s an XL, as all players were issued with that season, whether they were Gary Brabin hefty or Ian Goodison stick thin. We do have a matchworn 1999/00 home shirt already, but they are rare enough to justify having two, and this one apparently going for a penny short of £50 makes us weep. I think I know why we stopped doing these auction reviews, as seeing shirts you could have had but somehow missed them is most distressing. Still, there’s no use crying over sold polyester, and there is always February! Kit Tracking – The season so far Dame N’Doye : Serial kit thief?